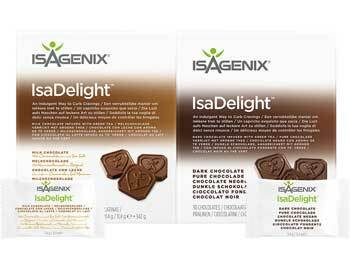 Isagenix IsaDelights - Delicious, Healthy Chocolate! Isagenix IsaDelights £ £26.00In stock! Order now! More than just chocolate, IsaDelights are packed full of B vitamins, minerals, antioxidants, and amino acids to help curb cravings and much more. If you want a quick and delicious physical and mental boost, these specially formulated chocolate squares are guaranteed to satisfy and make the perfect guilt-free treat. These are available in delicious sea salt & caramel flavour. For more information about these tasty treats and how they can benefit you, download the product information guide here. Despite their chocolatey goodness, IsaDelights only have four grams of fat and 60 calories per piece, making them a delicious treat your body can actually afford to eat. You can enjoy IsaDelights on both Cleanse Days and Shake Days to curb your hunger and keep you away from the biscuits or fish and chips. In the UK, these are available in delicious sea salt & caramel flavour. Not only are they delicious and guilt-free, but IsaDelights are also rich in antioxidants and amino acids. This means, in addition to curbing your cravings and tasting great, they also provide you with added vitality and help you look and feel healthier. The proprietary blend of amino acids in each Isagenix IsaDelights square are delivered through chocolate containing eight times the amount of flavanol found in strawberries. This means they cleanse the body of toxins and support heart health as well. Plus, they don’t contain any artificial sweeteners, flavours, or colours. IsaDelights are comprised of 70 percent non-alkalised cocoa powder and are produced via a specialised low temperature process in order to preserve antioxidant potency. They’re also infused with antioxidant-rich green tea, which increases thermogenesis. It’s without a doubt the world’s most sensibly delicious chocolate treat! IsaDelights were one of the very first products launched by Isagenix, which means they’ve stood the test of time and continue to be a top-seller year after year, and for good reason. These popular treats use 100 percent ethically sourced cocoa beans rich in antioxidants and oleic acid, both of which are signs of high-quality cocoa beans and offer a number of health benefits. With only 60 calories per chocolate square and a deliciously sea salt & caramel chocolate flavour that is hard to resist, Isagenix IsaDelights are the perfect snack to curb hunger pangs on Cleanse Days and indulge your cravings on Shake Days. You can enjoy IsaDelights by themselves for a guilt-free treat whenever you like. However, it’s recommended to enjoy them as part of an Isagenix nutritional cleansing programme for optimal results. When you do so, you should eat one or two on Cleanse Days and one or two on Shake Days. On Cleanse Days, it’s best to enjoy IsaDelights as a mid-morning and early evening treat to curb hunger pangs, resist temptation, and keep you going. On Shake Days, they’re meant to be enjoyed as an afternoon snack and as a dessert substitute. 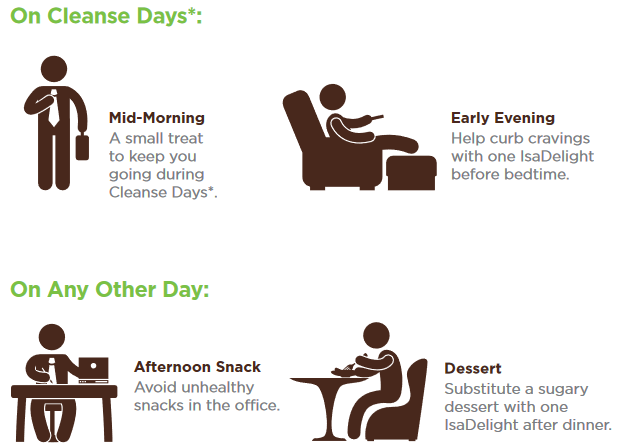 By following this schedule and your Isagenix regimen, you’ll feel better and become one step closer to reaching your health and fitness goals. In the UK, you can buy Isagenix IsaDelight chocolates in delicious sea salt & caramel flavour. How Much is a Box of IsaDelights? Each box of 30 chocolates can be purchased for £35 at full retail prices, or sign up with us (UK’s #1 distributor) and pay just £26 per box! Read Isagenix IsaDelights reviews from real Isagenix UK customers!